Photo: Courtesy of Kristen Ford. Calling all Halloween procrastinators: Wouldn't it be awesome if you could ditch the expensive and/or complicated getup and simply head out on the town to celebrate in clothes that you already own? It's possible — if you put your makeup bag and brushes to work, that is. Exhibit A: When R29 friend (and contributing editor at Autostraddle) Kristen Ford ran out of time to create a Halloween costume, she decided to don primary-colored clothing and let this crazy-cool Lichtenstein-inspired pop art makeup be her costume. The best part? Ford used makeup that she already had to create the look (i.e. no special trips to Ricky's required). Ford used a combination of Maybelline Eyestudio Master Precise Ink Pen Eyeliner and MAC Fluidine to draw comic-book-worthy black outlines, shadows, and wrinkles. (She even used the combo to pencil in her eyebrows, and drew on fake lashes rather than buying them.) For the tears, Ford splotched on blue cream liner, and then traced around it with the same black liquid eyeliner. Finally, Ford applied bright red lipstick, and then added the signature Lichtenstein dots with dabs of Benefit High Beam (Hint: Ford created the grid-like dots by starting with a vertical line of dots down the bridge of her nose, and horizontal lines across her cheeks). 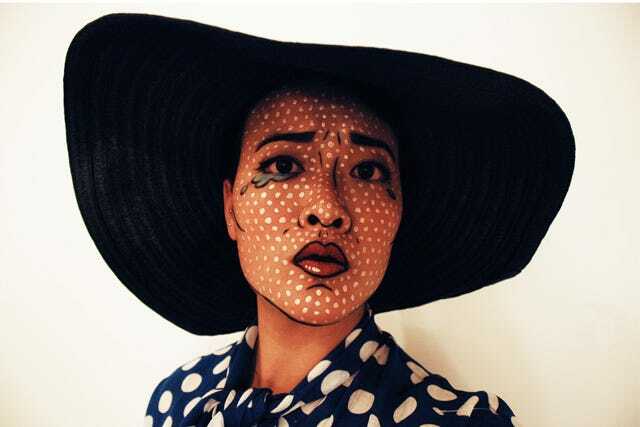 Et voilà — a totally cool, artsy Halloween costume, on the cheap! You better bet that we'll be practicing our face-painting skills to get that furrowed brow dead on.